Yiannis Gavalas, Panagiotis Menardos and Dimitris Rousounelos, three members of the Mykonos Gastronomy Club, present a dish that features local flavors that have withstood the passage of time. Brown-eyed beans, a local variety of black-eyed peas, are small, delicious and wonderful for stews. Here, the food experts combine them with another local delicacy, octopus. Place the octopus in a deep saucepan with a lid (don’t add any liquid), cover and simmer over medium heat for 35–40 minutes. Check if it’s cooked by poking a skewer or a fork into one of the tentacles. Add the vinegar and the oil and bring to the boil for 2–3 minutes. Remove from heat. Meanwhile, place the beans in a pan with 1 liter of water and cook over high heat for about 10 minutes until half-done. Add the rice and salt, and cook for another 20 minutes until beans and rice soften. Drain any excess liquid. Meanwhile, heat 2 tbsp of olive oil in the frying pan and fry the bread croutons for 2–3 minutes until crispy. Remove with a slotted spoon and place on paper towels to drain excess oil. Heat the rest of the olive oil in a broad pan over high heat and sauté the onion until golden. Add the beans and rice, and then the vinegar. Stir gently until it is all well mixed together and place on a platter. 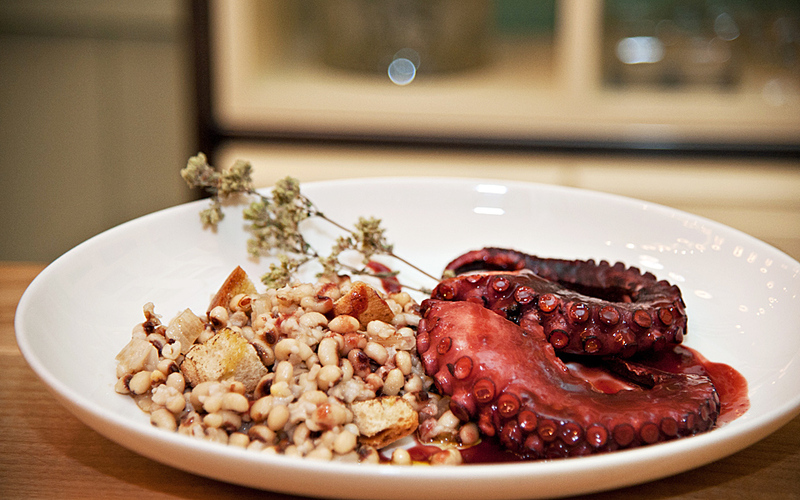 Place the octopus on top, drizzling with olive oil to serve.